Algae growth is a common problem in swimming pools, and pool owners generally have to deal with algae at least a few times a year. Algae spores blow into the pool, or are deposited by rain--or even human contact. With the presence of carbon dioxide, warm weather and off-balance pH levels, algae thrive. 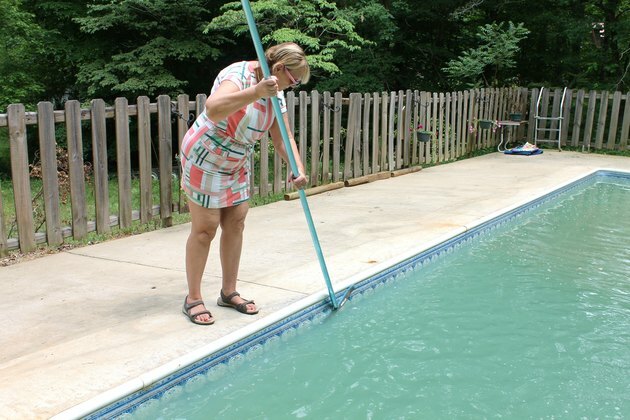 Swimming pools affected by algae may develop green water or slimy deposits that are yellow, green, pink and black. Knowing how to use algaecide can help you keep your swimming pool clean without excessive use of chlorine. 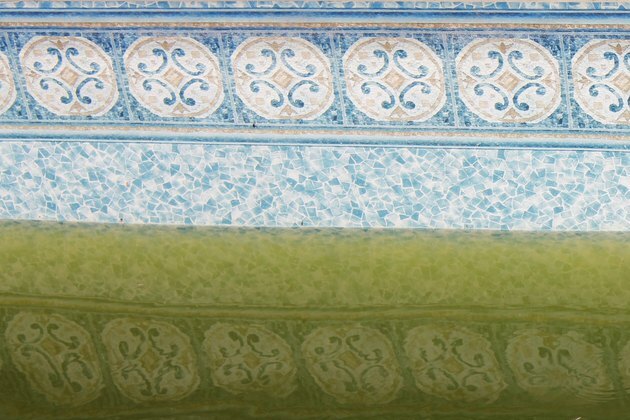 Choose the correct algaecide for your pool based on the type of algae present. 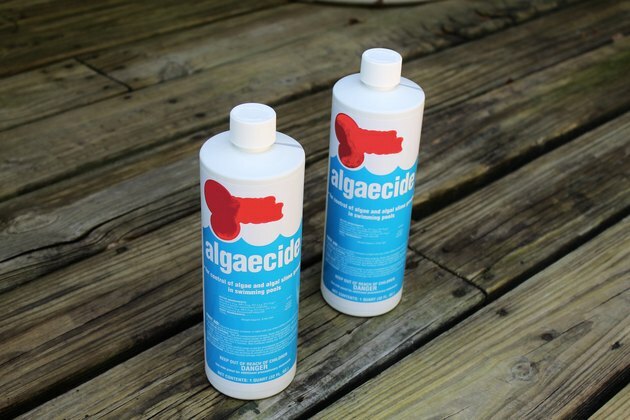 Some algaecide products are all-purpose, meaning they treat several kinds of algae. However, if you have a specific type of algae, choose the appropriate algaecide. For example, copper-based algaecide best treats yellow algae, while silver algaecide is effective on green and black algae. 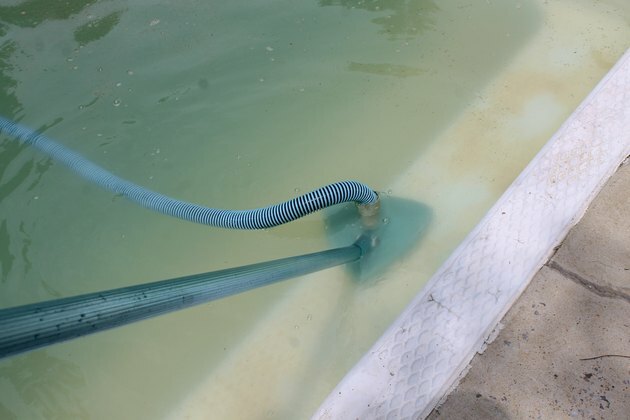 Determine the amount of algaecide to add to your swimming pool. Follow manufacturer's directions on the algaecide bottle for proper measurements. 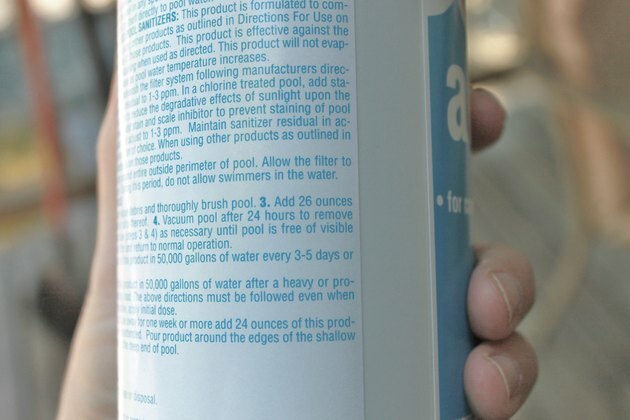 Dosage will be based on the gallons of water your pool holds. Before handling the algaecide, put on the rubber gloves and eye protection to avoid skin burn and possible eye damage. 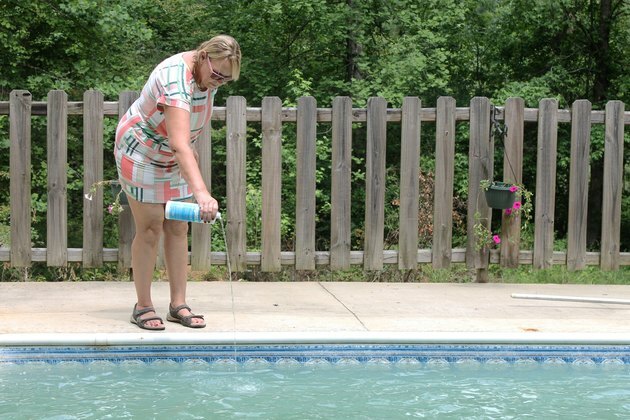 Pour the algaecide dose into the water, depositing it in several areas around the pool. Your swimming pool pump should be running at this time to help circulate the algaecide. Wait about 30 minutes before allowing anyone to swim after the algaecide application. Vacuum the swimming pool 24 hours after the first application of algaecide to remove the dead algae debris in the pool. If algae is still visible in the water, repeat the application of algaecide in the pool, following manufacturer's instructions. Scrub the bottom and sides of your pool before the first application of algaecide if algae growth is heavy and pronounced. For this scenario, wait at least 24 hours before swimming in the pool. 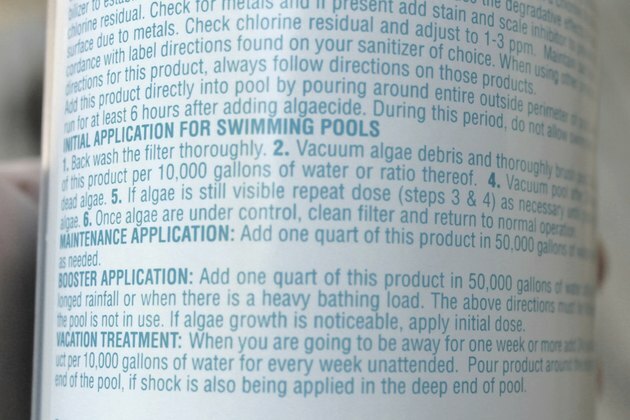 Follow the manufacturer's instructions on your algaecide for applying maintenance doses once the problem growth has been defeated. Every three to five days is recommended in hot temperatures, or if the pool is being used heavily. Can You Swim With Algaecide?